An exhibition of David Hockney’s iPad-based drawings made using a Brushes APP and a stylus and drawn with bold lines so that they could be enlarged, printed out on four sheets, and the paper mounted on dibond to be framed and hung on a gallery wall. I believe this is the first time that iPad-based works have been shown in a private gallery in London. 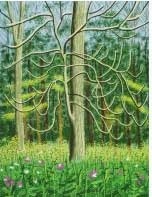 Trust it to be David Hockney. The implication is that whether you use a stick of charcoal on paper or a stylus on a touch screen these are but tools. What matters is your skill as an artist. Trained in Bradford School of Art and the Royal College (in 1953–57 and 1959–62 respectively), Hockney is one of those who suffered for his art – that is, missed, I imagine, not a single class in perspective drawing, training his hand and eye meticulously. He can look at a woodland track and on this tiny screen take the viewer unerringly through the picture plane while at the same time “thinking big” so that the marks he makes will later translate perfectly to the large scale he has in mind when they are framed and hung on a gallery wall. Nowhere is this more apparent that in DH0619 (28 April 2011) where the drawing is so freehand it becomes lyrical. It’s sold of course. Look at the artistic references we have in this print. Hockney's education in and homage to those before him showing up loud and clear. At the time of writing, DH0666 (4 May 2011) is still for sale. Hopefully they will have done so already, but I would urge anyone in charge of a national collection to empty their pockets for it. It depicts a woodland edge, with starting-to-bleach-out undergrowth and, in the foreground, the brightness of woodland wild flowers. All that's missing is birdsong. And perhaps a touch more tightness in the curation overall. David Hockney’s series of charcoal drawings – portraits no less – of the Woldgate woodlands of East Yorkshire in winter and not for sale. The artist has used five different viewpoints from which to record his woodland over a timescale that takes us from bare branch to the blossom and new leaves of a new spring. They are beautiful: black and greyscale drawings that incorporate deftness and muscularity. One snowy landscape has a path leading steeply uphill to the horizon. Another accurately depicts the country winter season’s most soggy moment where the snow has melted to fill an ancient woodland dip that is now flooded with icy water. 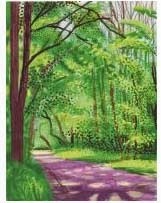 Yet another, finely worked, shows mixed woodland in its most sumptuous bursting of blossom and new leaf. These familiar and neglected green things are what give us life.